There are some statements by Chazal which have recently been challenged by people who claim to be Orthodox Jews. These people don't come out explicitly and declare Chazal to have been mistaken, but they do make it very clear, by their policies, that they are disputing Chazal. They seem to think that Chazal were wrong, or that the social conditions of our time have made Chazal's declarations obsolete, or that when Chazal made blanket statements they intended there to be numerous exceptions. This is very disturbing. There is no reason not to think that Chazal were correct in these cases. Furthermore, recent evidence clearly shows that Chazal were indeed correct. Yet in most parts of the Charedi world, they act otherwise. After all, official educational policy is not to teach their children a trade, and not to accompany the study of Torah with work. They clearly demonstrate that they do not believe these words of Chazal to be true. But Chazal were correct! From the graves of these giants of wisdom and purity emerges the truth that can never be repudiated by the midgets of our generation. Ve’ain leharher achar divrei haGemara. These rules of which Chazal spoke rest not upon transient psychological behavioral patterns, but upon permanent ontological principles rooted in the very depths of the human personality, which is as changeless as the heavens above. It is based not upon sociological factors; it is an existential fact. It was true in antiquity; it is still true, and it will be true a thousand years from now. And the facts prove it. On a different note: I still have openings in my summer lecture tour in the US. Please be in touch ASAP if you would like to arrange Shabbos or weekday lectures in your community - you can write to me at zoorabbi@zootorah.com. Second impression: They could say it. We can't! Love the poster, but hasn't it been pretty much been accepted that there's no real source for Rashi having been a vintner? >Love the poster, but hasn't it been pretty much been accepted that there's no real source for Rashi having been a vintner? No. The claim is contested by Haym Soloveitchik, but whether he did so definitively and convincingly is up for debate. You can read his full argument here. It's irrelevant; either way, Rashi certainly worked for a living. In Ashkenaz at that time, it was unthinkable for people to even take money for teaching, let alone learning. But Rashi did not commute to a 10-12 hours-per-day mind-numbing corporate employment-at-will job with 2 weeks of vacation per year at which he would be expendable and unemployable anytime after he reached 45 years old. The question might not be learn vs. work-and-learn. It might be learn vs. work. Chaim - Although I have a degree of sympathy for your sentiments, there are several issues with this attitude. Firstly, I'm not sure if historically people worked less hard than they do now - it's not as if everyone throughout history was able to learn all morning - the very fact that the average male is able to spend several years in high-school and afterwards learning much of the day, which was not at all possible earlier, has resulted in a laity that is more knowledgeable, on average, than at any point in recent Jewish history. Furthermore, the average working day often includes a long commute - this is a perfect time for learning as many a lowly baalebos will attest! Secondly, if we follow your argument to its conclusion, you seem to be implying that since nowadays we can't 'learn and earn' we should therefore only do the 'learning' part. The fact is that even people who are 'learning' need to be provided for - so are we just supposed to insist that the unfortunate, non-learning earners to support the holy learners? Surely you see that this is rather distasteful. More fundamentally, surely we should view the Torah as a blueprint for a successful society, and not that the religious community can only survive in an ideal fashion by living off the hard work of others. There is already statistical evidence that certain economic indicators have taken a turn for the worse in Israel due to the decision by one segment of society to rely on others for their sustenance - your version of Judaism will entail that the state of Israel will become less and less economically productive and successful (and eventually have to rely on international aid, and import all professionals and others necessary for the upkeep of a modern state, if the whole population adopted current charedi norms) as more people make the 'right' decision. To paraphrase Dr. David Shatz - for me this is a reductio ad absurdum although for others this may be an in hakhi nami. These rules of which Chazal spoke rest not upon transient psychological behavioral patterns, but upon permanent ontological principles rooted in the very depths of the human personality, which is as changeless as the heavens above. It is based not upon sociological factors; it is an existential fact. Pure R'YBS from tan du. Where are the R'MS and R'UR? Chaim, although many people work long hours, the fact is that part-time jobs, and regular 9-5 jobs are commonplace, as are opportunities to be self-employed or an independent contractor, and thus able to set your own hours. In fact, one of the biggest best-sellers of the last few years is The Four-Hour Work Week, which teaches people (effectively, according to much reader feedback) how to have a decent income while working fewer hours. So it's not the case at all that there's a stark choice between all Torah and no work and no Torah and all work (both of which, as the Sages recognized in Avot 2:2. are bad choices). "the fact is that part-time jobs, and regular 9-5 jobs are commonplace, as are opportunities to be self-employed or an independent contractor, and thus able to set your own hours"
It's also commonplace that people do not meet their tuition obligations. You also mention the "four hour work week" which is bestseller by virtue of the get rich quick scheme it barely conceals beneath the surface. I read the book, and then I bought a lottery ticket. Set your own hours, be your own boss, etc. etc. cliche after cliche. But I didn't mean to turn this into a debate about jobs and career choices. Go to the orthonomics blog and debate it over there. My point with my original post was that it's not poshut to tell people to go to work instead of learn. Let's not throw around terms like "work" without a "working" definition of what exactly it means. Is it more productive to have 30 people working at corporate clerical jobs or as minimun-wage service sector employees? Or do we want 1 person to be a success on Wall Street and support the other 29 in kollel? But thanks to a miraculous change in the nature of the world, the laws of physics and common sense being tossed around like a salad, the above values no longer hold. No, now it's all Torah all the time, baby! Even if it kills us! So take heart, strident defenders of Chazal - the statements of our Sages regarding Torah & Derech Eretz, teaching one's son a trade, etc. may "appear" to be wrong - but rest assured they were 100% true at the time they were said. You may wish to note the Rema's words there (in S'if 21) as well as the source for them in BT B'rachos 8a: "Amar R'Chiya bar Ami amar R'Yochanan:Gadol ha'Neheneh.."etc. Chaim, the question is not what is "productive." Chazal said to combine work and Torah study, and indeed that is still possible to do. So we should do it! "Ve’ain leharher achar divrei haGemara". The Tannaim bring destruction upon the world. How can it occur to you to say that they bring destruction upon the world! Rabina said: Because they[=others] decide points of law from their teachings. "... and I am horrified to see well-meaning Anglos who think that it is the derech haTorah to bring up children in a system that discourages working". It was taught: R. Nehorai said: I abandon all trades in the world and teach my son only Torah, for every trade in the world stands a man in stead only in his youth, but in his old age he is exposed to hunger. But the Torah is not so: it stands by him in his youth and gives him a future and hope in his old age. Of the time of his youth what Is said? But they that wait upon the Lord shall renew their strength; they shall mount up with wings as eagles. Of his old age what is said? They shall still bring forth fruit in old age; they shall be full of sap and green. Ah, I have a whole post planned about R. Nehorai. Take a look at the meforshim. R' Shimon b' Yochai in Berachot and R' Nehora'i at the end of Kiddushin represent the minority opinion on torah and work in the talmud. R' Ishmael in Berachot and the other Tana'im in Kiddushin represent the majority view. As Abaye stated relative to the dispute between R' Shimon and R' Ishmael, "many did like R' Shimon and failed, while many acted like R' Ishmael and succeeded". According to the Chatam Sofer, while the recommended practice in Europe was to teach only torah. The given rationale was that life there was too insecure to hope to establish a lasting source of income. The only lasting achievement was, therefore, in the field of torah. In the Holy Land, however - he stated further, there is no excuse not to engage in productive labor since such activities are a mitzvah. Of course, this pesak was disregarded both in the old Yishuv and among contemporary Hareidim despite their labeling the Chatam Sofer as the "head of the entire golah" (that would include Israel in their eyes). The Margaliot HaYam on Sanhedrin was written by a librarian with time on his hands. >>>> Ah, I have a whole post planned about R. Nehorai. Take a look at the meforshim. Reb Natan, I certainly look forward to it, but there is no need…simple reading of the text is that R’ Nehorai was talking about teaching your children Torah, not about someone should spend his life learning Torah Lishmo. What’s more, even the Torah talks about teaching your children. where does it say in the Torah, overtly, that there is a mitzvah to learn Torah just for the sake of learning. On the other hand, it clearly and repeatedly tells mankind to be working “shshet yomim”. The Rishonim did not pasken like Rav Nehorai. No one is arguing that there is no shitta in the Talmud that endorses full time kollel and not working at all. Rather, that the halacha is not like Rabbi Shimon. Even Rabbi Yosef Karo, who defends accepting payment for Torah study, and states that all these rabbis only worked when they were students but not when they were leaders, (Kessef Mishne 1st answer) still cites the Rambam's harsh quote from the Mishna in his Shulchan Aruch. Apparently, RYK either meant his law for the students, hence kollel boys, or he is deciding like his other option in Kessef Mishne - that of horaas sha'ah, so that Torah should not be forgotten. But the basic halacha is that it is prohibited. RYK definitely did not mean it as a hetter for the masses. 1 - Rabbi Slifkin - Great post! I enjoyed it very much! 2 - I would like to see an entire rational blog devoted only to this discussion and this issue. 3 - Whenever I bring up this issue with my friendly neighborhood Chareidim, they say "Talmud Torah k'neged kulam!". They take this to mean that learning comes before all mitzvos, including supporting one's family. 4 - Chaim - There are a few problems with your idea of one Wall Street "success" supporting 29 families learning. First, your numbers don't add up. There are very, very few Warren Buffets in the world. And there are very few Wall Street or even corporate success stories, never mind FRUM Wall Street or corporate success stories. How many successful American companies are there already? And in those companies, how many religious Jews get to the top? Fewer than you can count on two hands. Why? Mainly because with Shabbos weekly, and many Yomim Tovim, frum men have a very hard time competing with unmarried, secular, career-driven Americans who competed their whole working and educational lives for those goals, starting with excellent secular high school educations, continuing to Ivy League colleges, to competing fiercely at work - often working Saturdays and Sundays. Not many frum boys are able to do that. Very, very smart, driven, highly educated and hardworking frum men on Wall Street or in Corporate America can earn 6-figure salaries. But after paying full yeshiva tuition for 5 or more kids, college loans (yes, that good education which got them a good job cost them a pretty penny!!) a mortgage, car payments, and the cost of yomim tovim, there's not enough left to support even 2 other such families, let alone 29 other families. I have a brother who would be considered an "American" success with a great college education and a corporate executive position in a top American company. But with a few kids and all of the above expenses he cannot make it without his wife working (and their standard of living is very simple). The other problem with your argument is historical precedence. For centuries Jews were very poor with a few scattered rich success stories here and there. The general population which were the "working poor" WORKED and no "Gadol Hador" told them that it would be better for them to not earn the meager amount that they managed to bring home, and rather to sit in the beis medrash all day and learn instead. They were expected to work hard earning their meager salaries. During some periods when Jews were not allowed into many professions they had no other choice but to take jobs that were as menial as it gets - working in the fields, fertilizing the fields with manure and other "dirty work" that we would balk at doing nowadays. They also worked from sunrise to sunset. In the summer those were very long hours. In the winter, although the hours were shorter, the freezing temperatures made work that much more difficult. Not many were afforded the luxary of working in climate-controlled cubicles. People died in the winter simply from the extreme cold. Then there is the problem of relying on one or even a few people to be a "success" when there is never any assurance of that "success" nor it's continuity. Anyway, the point is that one wealthy person usually cannot support 29 families (unless it's Warren Buffet or Bill Gates, both of whom are only a one-in-a-few-million occurance). And never was there an exemption from working because the income earned would be too small to make it "worthwhile" and the time would be better spent in the beis medrash learning. It was considered to be worthwhile no matter how little the earnings. 1. There are Talmudic texts in both directions. This issue will, therefore, not be decided on that basis. 2. The advocates for full-time learning, like some of the Talmudic texts, believe they are saving the world by learning. 3. Just as the case of a Nazir, the Torah does not forbid asceticism, it merely regulates it. 4. If someone wishes to learn full time, on the basis of their own funds or fundraising, fine. 5. Just don’t do it on the backs of non-consenting taxpayers. The problem is not the kollel system, per se, it is that they have internalized “magiah-li” selfishness that is antithetical to Jewish values: i.e. שלך שלי, ושלי שלי--רשע. 1. There are Talmudic texts in both directions. The OVERWHELMING thrust of the various discussions in the Gemara and Rishonim is that a person should work for a living. R' Slifkin - forget R' Nohorai. Address Rambam - his example is NINE hours learning, and just three working! Sure, that's the ideal! And if one cannot support oneself adequately in 3 hours of work, then, according to Rambam, one has to work more! I can only second what Yishai and others have mentioned -- that work doesn't necessarily have to be a white collar job far from home, although sometimes -- very unfortunately -- that can't be prevented. I really do see that things are changing. Even the most dedicated kollel families with good shalom bayis and good attitudes have at least one boy who is not into learning, and is even showing (for lack of a better term) early signs of "at risk" behavior. This is causing the parents to re-evaluate their derech and open their minds. It's painful, but a lot of good can come out of it. Is this a Chasidish thing to do? I don't recall seeing or hearing that in my circles. I take it you are make a separation clause between living & deceased people. Whether one should spend nine hours a day studying Torah or nineteen is a nice theoretical discussion for an ideal world. The reality is somewhat different. The money isn't there. Without social welfare programs and private charity the system would have collapsed years ago. Government money just isn't there anymore. Not here, not in Israel. Private charity is drying up because people don't have the funds to spare. The kollel generation will be forced to work, not just in gender-segregated jobs within the community or ritual-based ones like shochet or mashgiach. It can't all be up to a wife who has no education beyond 8th grade and an unaccredited "certificate" in some low-level job skill, and it will have to be work which can support the entire family. The question is whether it will be done in a rational, planned fashion which minimizes suffering and the time taken to achieve self-sufficiency. What R. Nehorai said, the Rambam's writings, Chatam Sofer and so on will not alter this. The question is how best to prepare for these conditions and how best to follow our ancestor's traditions of thrift, industriousness, creativity and productive work. You said, "It can't all be up to a wife who has no education beyond 8th grade"
Where do women have only an 8th grade education? In my Israeli Chareidi community, all of the girls finish 12th grade, and the vast majority (like 98%) go on for at least one or two more years of vocationally-oriented education. It seems to be the whole question boils down to what the life-goal of a religious Jew should be. The "Talmud study is the be-all and end-all of Jewish spirituality" that the Litaim seem to push apparently relates those of us who don't excel in Talmudic studies to a spiritual wasteland. Is that correct? My understanding of Hasidic thought is that they say that any Jew, regardless of his level of learning is capable of spiritual greatness, either by doing mitzvot with great kavanna, or by doing hesed for those in need, or even doing tefillah with great devotion. Rav Slifkin's sources among the Rishonim who say that the purpose of learning Torah is to perform mitzvot properly seem to be indicating that the "Hasidic" approach to life is the correct one, but if the Litai approach is correct, then the view that as many people should learn-full time as possible makes sense, because if they don't, they will end up being am ha'aretzim their whole lives and their lives won't be of any spiritual significance. What is the point of posting this except Charedi bashing? How does this relate to Rationalist Judaism? The purpose of the post is to educate people. As I mentioned in the post, living in Israel, I see the catastrophe of people who ignore Chazal's words, and I am horrified to see well-meaning Anglos who think that it is the derech haTorah to bring up children in a system that discourages working. Some of them may be reading my website, or they may be in communication with those who do. Is this poster published by the Israeli Conservative movement? 1. While the Chareidi worldview is filled with moral and intellectual failings, the idea of universal kollel for one's whole life is their most obvious Achilles' Heel. 2. Chareidim complain when an MO seeks to improve women's standing by appealing to minority opinions and changing social realities. But this is the exact tactic that Israeli Chareidim use with universal kollel. This unmasks the Charedi pretention that what defines them, is being more loyal to the sources than the MO approach. 3. Every instititution aims at self-preservation. Universal Kollel is clearly unsustainable and will eventually blow up the Israeli Charedi world. The question is, can Israeli Charedim reform themselves by giving it up or do they define themselves so strongly by universal kollel (and avoiding the army etc...) that they see giving it up as in essence annihilating themselves and so prefer to let the ship sink. Michapeset, thanks for your analysis. Y Ben-David, I agree with the sentiment "It seems to be the whole question boils down to what the life-goal of a religious Jew should be." We need to replace the misguided goal of "universal kollel" with something else that we can strive for, like Torah im derech eretz by a different name. We need a mission statement for our lives. What a pity that it took the Conservative movement to point this out so effectively. I guess we'll have to apply Rambam's maxim of accepting the truth from wherever it comes. Didn't the whole learning full time thing start as a response to the Holocaust where we lost so many talmidei chachamim and gedolim? So much Torah was lost so the gedolim decided that it was very important to forgo what we were used to (working for a living as well as learning whenever possible) in order to "save clal yisrael" and strengthen those who had survived. So many great people preished that they had to find a way to "make up for" the loss. I looked at it more like an "eit laasot l'Hashem" and not necessarily something that should be continuing forever. Unfortunately, this has become the norm in certain circles and people who do not conform are looked down upon. What is very interesting is that in sfradic communities there is more of a tendency to work and learn. I've always found that in ashkenazi kehillot it is looked down upon to work while it is more acceptable to the sfaradim. This is part of their culture and beliefs. This is something that they did for generations. They always worked and learned. As for the ashkenazim, after churban Eropa, they were forced to try to compensate for the loss of great Torah knowledge and many Torah scholars. ..after churban Eropa, they were forced to try to compensate for the loss of great Torah knowledge and many Torah scholars. There were not so many Torah scholars. That is the revisionist history that ArtScroll and other Chareidi publishers print because it is what Chareidim would like to believe. If you ever go to Europe and visit the "Great Yeshivos of Europe", you will see how small they actually were in size. That is not to say that there were not lots of communities destroyed which each had a community rabbi. This rabbi learned (and trained) for a period before becoming the rabbinic leader of the community. There was only one per community though and they serviced the community for all rabbinic leadership needs, including counseling and teaching. I still want to know what the answer is to Chareidim who claim that "Talmud Torah k'neged kulam" (which is a Mishnah, said every day in davening) and that learning Torah is not just of primary importance but it goes before all other mitzvos ("k'neged kulam"). Isn't that a Chazal? BB, that was the point of the original deal struck in the early days of Israel. Preserve enough knowledge and train up enough scholars so Judaism could continue. It was not meant as a permanent drain on the economy or a way to put all the Orthodox in a permanent state of dependency. A combination of self-reinforcing trends, political opportunism and a misplaced Romanticism gave us the situation we have today. Some excellent scholars were produced. We absolutely need them. They are worthy of our support. But for every one of those there are many who are trapped in poverty, can never fulfill the mitvah of supporting their families and who are not fiery Suns of learning. Frankly, many of those I've met can recite what they've been taught by rote but cannot analyze those texts well enough to exercise logic and judgment. A true scholar needs to be more than a tape recorder. He must be able to think critically and creatively, to internalize the knowledge. Not everyone can. It does them and their families a disservice to be square pegs in round holes. Better for all if they live productive lives, learn what they can and raise their children to be good, happy Jews. Those are much more important than spending decades memorizing in order to conform to social pressures. I disagree. The kollel system is not the source of the haredi fraud. It's their attitude to the secular and gentile society, which they consider inferior. They quite openly justify their fraudulent behavior. For example, this week's Der Yid calls Shalom Rubashkin a 'korban tzibbur'! Der Yid's readership doesn't learn in kollel as a way of life nor does the Lubavitcher communitiy that Rubashkin comes from. I love kollel and there is no reason for full time learners not to treat everyone as 'haviv odom shenivra bezelem'. The problem is with the Haredi society as a whole ve dai lemevin. "Is it more productive to have 30 people working at corporate clerical jobs or as minimun-wage service sector employees? Or do we want 1 person to be a success on Wall Street and support the other 29 in kollel?" This is how the lazy bums who refuse to work justify their demand to be supported by others who do. It doesn't mean what they're claiming it to mean. I'll do a post on it one day. Michapeset, what it means is that, in general, it's more important than other mitzvos. It is not meant to obsolve one of supporting a family and giving them necessary time and attention or following the law. Carol, it doesn't necessarily mean that at all. Michapeset, your historical analysis is well-done and well-said. Joel Rich, I think we agree. I myself am very into learning and I think people should be and do so according to your quote of the Gra. But, as has been discussed frequently, lots of boys aren't so interested in Mishnayos and Gemara, which is often what people mean when they say "learning." Personally, I do not see the point of massive Gemara learning unless you are trying to figure out an issue (like brain-death or stem cell research) or want to be a posek. I personally have gotten a lot more out of learning Tanach or philosophical works. And in fact, I think learning in depth and with hasmada works like Derech Hashem, Tomer Devorah, and Chovot Levavot, etc., are a lot more beneficial, both spiritually and practically than Talmud b'iyun. "What a pity that it took the Conservative movement to point this out so effectively. I guess we'll have to apply Rambam's maxim of accepting the truth from wherever it comes." On the contrary... It takes one to know one. The more you write about the Charedim, the more I see that they are no different than the conservative movement. They pretend to follow halacha, but really, they just follow the pre-approved board of rabbis which dictate anything and everything based on many different sources, with halacha being last resource. The conservative movement might make Academia their new Torah, but Charedim make folk tradition and economic interest theirs. Both groups are equally halachic in practice, and so they are able to better and more sharply criticize one another... as they say, it takes one to know one. "I still want to know what the answer is to Chareidim who claim that "Talmud Torah k'neged kulam" (which is a Mishnah, said every day in davening) and that learning Torah is not just of primary importance but it goes before all other mitzvos ("k'neged kulam"). Isn't that a Chazal?" Where can I get a printable version of that image?! It occurred to me that if the Masorti movement were really interested in getting this message across successfully, they should not have printed their name on the poster!
" Lastly and perhaps most importantly, we need to consider that it is quite easy to take pot shots at the charedi/kollel system. Unfortunately, it is probably just as easy to critique any modern community. If the charedi community is suffering from the consequences of disparaging a practical attitude towards making a livelihood, other communities are sadly suffering from laxity in Torah study, knowledge, and simple observance. **sigh**"
Unfortunately for a large proportion of the MO community, MO means 'selective halakhic observance'. Whilst the top end of YU is very serious, there are some in YU for whom MO means 'selective halakhic observance' Where I live, in England, there is a problem that all universities are secular and, from my observation, there are some who went to MO yeshivas for 1 or 2yrs who come back and are heavily influenced by the secular university culture. RNS,I would be interested to hear your thoughts on the matter and what you think the solution is. I am not charedi, and disagree with many of the tenets of charedi Jewry,but I think the MO have some serious(albeit different) issues they have to deal with. Ameture, I am lost. What are these principles of Torah. RS, I thought what I wrote was the discussion in Maseces Megila. The idea is that TT has a dimension that other mizvos don't have. No? 1) There is no, a for all vocational education system in the charedi society, and yet, we do see a great deal of dishonesty and deceitfulness. 2) Even those charedim that do learn Torah, but do not work, are involved in illegitimate and violent behaviour. What more prove dose one need to see, that Chazal was right with these two dictums. About the Rambam dictating 3 hours of work...compare that to his actual lfiestyle! To become a Talmid Chochom. This is what Tannoim and Amoroim did. Isaac, I agree that Chazal were right. What I am saying is that today there is a cultural attitude in the Charedi society that sanctions fraud and that kollel is not the source of it. The problem is much bigger. As far as Talmud Torah Kneged Kulam goes, I think of this as a rhetorical flourish. The Talmud also equates observing Shabbat to keeping all the mitzvot, embarrassing a person to murdering them, and throwing soemthing in anger to worshipping idols. Why take any of them literally? "Both groups [i.e. conservative Jews and Charedim] are equally halachic in practice, and so they are able to better and more sharply criticize one another... as they say, it takes one to know one." What do you mean? It is so obviously false that I assume you must have some other intention. Or do you live in Israel and so have no first-hand experience with the way real life American Conservative Jews in America live? Carol..There is Kollel, and then there is Charedi Kollel. When a newly-wed chraedi man dose not attend Kollel after his wedding. It becomes an embarrassment to him and his family, and he is looked down on, as not being a true Jew. He is therefore compelled to attend. This is what makes it a charedi Kollel. And out of necessity he is compelled by his bad inclination. And his fellow Charedi admire not only his success, but his attempt as well, to acquire his ill-gotten gains. And as we know very well, Admiration, encourages. The Charedi Kollel is part of the system to discourage honest work, whether intentionally or unintentionlly. I have heard an argument being made by charedim for the justification for stealing. "If a young man with a wife and two children earning only $1000. a week, paying tuition, and $1200. for rent, I ask you, how can he not steal, he has to steal to make ends meet". What do they teach in Kollel? "What do you mean? It is so obviously false that I assume you must have some other intention. Or do you live in Israel and so have no first-hand experience with the way real life American Conservative Jews in America live? I live in Israel... but I grew up Conservative in America. So what about what I said is so obviously false in relation to Conservative Jews in America? They think they follow Hallacha. Doubly so the Mesorti movement in Israel. "Ameture, I am lost. What are these principles of Torah." 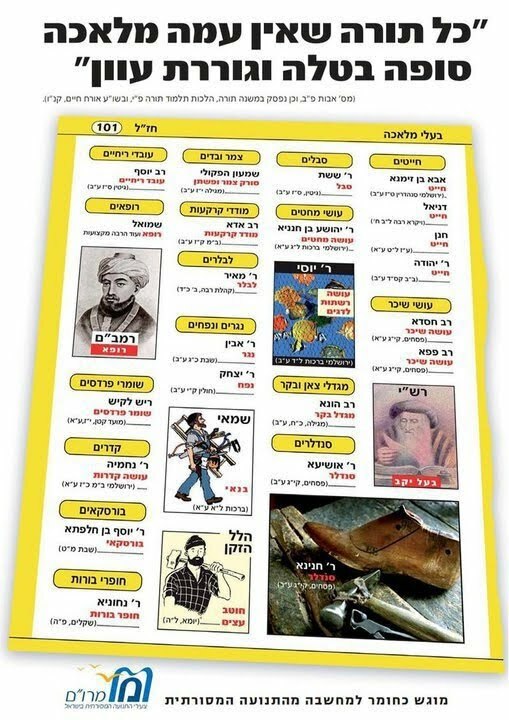 How to read Hebrew, how to read Aramaic, how to read the Torah, how to read Mishna, how to study, what to study, with whom to study etc..
You don't even have to have a halachic home if you can teach your kids how to learn Torah. (and that what it says is binding/ important) The kids will correct your behavior. About 99% of Conservative Jews (in America) keep virtually nothing of halacha, certainly not enough to be considered "shomrei mitzvot" by any objective criterion. The vast majority of Conservative Jews America are not trying to follow Halakha and have only have a vague sense of what Halakha is. And they don't have the slightest interest in what Conservative leaders say the halakha is. The Conservative Movement's Halakha is set by the Law Committee. I would be willing to wager a lot of money that the majority of Conservative Jews have never heard of the Law Committee. I believe you are greatly mistaken. I'm curious which surveys and or statistics you are using to make those claims. It's certainly not from the thousands of people who are sent to USY events or sent to Camp Ramah. I grew up in a NY area Conservative synagogue, of about 400 families, of whom the rabbi, the cantor, myself, and two men (not their wives) were shomer shabbos. Although there was a nice attendance at Friday night services, on Shabbat morning there was often difficulty getting a minyan. This, recall, out of 400 member families. The rabbi told me that in synagogues out of town the situation is even worse. I also grew up Conservative. In my experience, the committed Conservative Jews genuinely believe that they are following halachah. They literally believe they are following Hillel and the Orthodox are following Shammai. Your average Charedi (in my experience) looks first at the halachah, and then decides what to do. I have seen so many people do what they believe is the right thing to do, even when it is hard. (They don't always get a correct psak, but it is not for lack of trying or sincerity.) I am talking about the laypeople, not necessarily Charedi leaders and askanim. the Torah clearly and repeatedly tells mankind to be working “shshet yomim”. you might have left this part out of your comment. the torah *allows* *39 melachos* during "sheshet yamim". do jewish businesses that are closed on sundays encourage violation of working on "sheshet yamim"? is a person obligated to perform some of the 39 melachos every day of the "sheshet yamim"? "But Rashi did not commute to a 10-12 hours-per-day mind-numbing corporate employment"
"אפשר אדם חורש בשעת חרישה, וזורע בשעת זריעה, וקוצר בשעת קצירה, ודש בשעת דישה, וזורה בשעת הרוח, תורה מה תהא עליה?" Fact is, an unrelenting effort to earn a living to the exclusion of Torah study leads to disaster. "Chazal were correct, and the facts prove it." Obviously, we must accept both words of Chazal. We need not find a precise formula for reconciling the two statements. Rather, we must accept both statements as 100% true and use them as a guide for deciding how we will lead our lives. That way, we won't end up as thieves or ignoramouses. >>>> is a person obligated to perform some of the 39 melachos every day of the "sheshet yamim"? Actually, yes ... keeping 2 days "shabbat" per week might (i'm certainly no posek) run afoul of "ba-al toseph"